The SETI (Search for Extraterrestrial Intelligence) Institute has announced that it had raised more than $200,000 from a crowd-sourced fundraising effort that launched earlier this spring. The money, which came from just over 2,000 people who want to keep the search for alien life alive, will help the institute put its Allen Telescope Array back online. "We are so grateful to our donors," said Tom Pierson, who co-founded the SETI Institute with Jill Tarter (the inspiration for Jodie Foster's character in "Contact.") "We believe we will be back on the air in September." On the Setistars.org website, where the call for donations was originally placed, large red type proclaims: "Thank You for Your Support to Resume the Search!" The Allen Telescope Array, or ATA, is a series of 42 linked radio-telescope dishes funded by a $30 million gift from Microsoft Corp. co-founder Paul Allen. Built at the Hat Creek Radio Observatory in a valley near Mount Shasta, Calif., it is the first group of radio telescopes built from the ground up with the intention of being used full time to monitor the universe for radio waves that would indicate there is life on planets beyond our own. 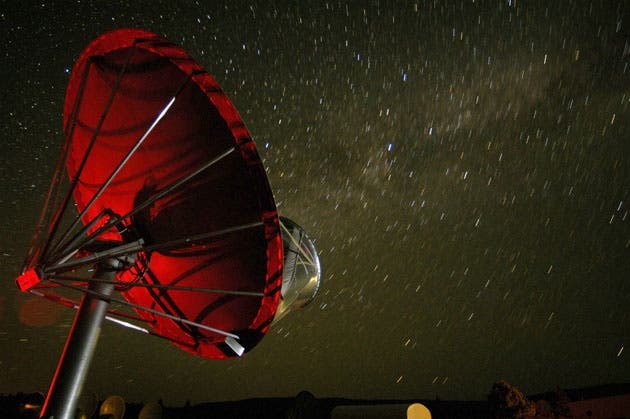 The ATA has been monitoring the universe consistently since 2008, but in April of this year, SETI and its partner, the Radio Astronomy Lab of the University of California, Berkeley, ran out of money and had to put the ATA into hibernation mode. The first image taken by the 42-antenna Allen Telescope Array (left) depicts the atomic hydrogen in the Andromeda Galaxy (Messier 31 or M31), the nearest large spiral galaxy to the Milky Way. 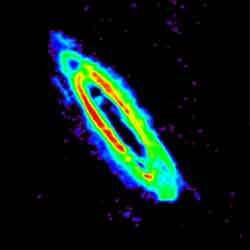 Unlike all other radio telescopes, the ATA can image large objects like M31 – its diameter is about five times the diameter of the full moon – all at once instead of piecemeal. The telescope's wide field of view makes it ideal for mapping the heavens in search of new radio sources." The colors, from blue to white, represent the intensity of the radio emissions and thus the density of hydrogen. Because atomic hydrogen is the stuff from which stars are made, the large "hole" in the center of Andromeda indicates that the galaxy is near the end of its star formation history. In the background are radio galaxies powered by massive black holes that are billions of light years away from Earth.